This is the same 18650 Lithium Ion Cell that you know and love, but now includes pre-attached solder tabs! These round high capacity cells have been mainly used in flashlight type applications but with its capability to be used as a drop-in rechargable cell at 3.7V with a capacity of 2600mAh. This battery has been made even better with the attached solder tabs. You now have a much wider range of applications to drop this battery into while still remaining simple to install! These 18650 Cells have a standard discharge current of 0.2C to a maximum of 1C and can handle about 300 charge cycles. How much do these cells weigh? Sorry if I missed it somewhere. Please don't use these for vape mods. They are only 1.5c and it is common to use 8c to 18c for that application. Make sure you do your research and know how to do the math to be safe. This is not like consumer electronics batteries where if they are physically the right size you can use them. When these industrial batteries are misused it is very violent. Seconded. Make sure the battery has an adequate discharge rating, and more importantly, a protection circuit. Otherwise you can cause a battery to vent, or worse -- explode. More information here. very very simple question, will the sparkfun LiPo charger basic micro-usb thingee charge this??? Why does it say Polymer in the title? 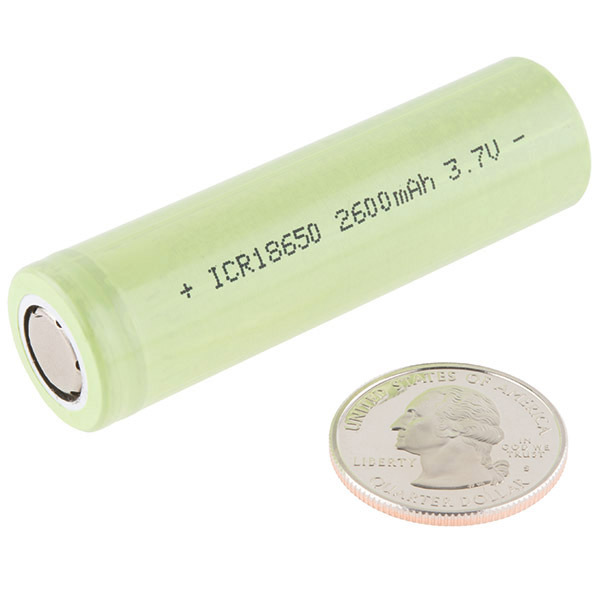 This is obviously not a LiPo, it is a cylindrical 18650 Li-ion cell. It seems implied by the video and description that these can be set up to make large banks of parallel batteries, however the comments from the other, standard Li-Ion batteries (the JST ones) suggest that they should not be placed in parallel unless the cells are carefully balanced. What sets these tabbed batteries apart from the JST ones in this regard? I built a 13 cell serial battery pack that required 26 of the battery clips. Solder tabs straight to a PCB would have been much easier/cheaper and probably more physically secure. It seems that series arrays would be much more dangerous because of reverse charge issues that simply aren't possible on parallel arrays and higher currents that naturally occur as a result of higher voltage. Parallel arrays distribute the current load and as the battery resistance imbalance increases, rather than reverse charge, the pack simply won't last as long. Not sure if anyone said this already but I believe that the Tesla's battery pack is an array of 6,800 of these cells.....so to say these guys are pretty scalable is an understatement :) Of course, you'd need to deal with cooling, charging and balancing if you wanted to power your home with these babies. Is this battery protected against over-charging, under-capacity, etc.? Or is it unprotected? I have this battery unit that says for best results, use unprotected batteries (the unit has its own protection circutry and the battery's evidently interferes with this). I just tested it with two protected batteries that claim to be 4500mA each, but I was only able to draw about 680mA at 5v power (figure about 1.0A at the battery's native 3.7v). The great majority of batteries I see on ebay are protected. I ordered one set of batteries that the seller claimed were unprotected, but they were protected when I opened the box. The seller did refund my money (and corrected the ebay listing for the batteries), but at some point I would like to try it with unprotected batteries. Unprotected. You must add the proper battery protection circuits. These are commonly used in laptops inside the battery pack, along with the proper protection and monitoring circuits. What is required to charge two of these in series to get to 7.4V? I understand that you need to charge balance, but is all it takes one of these set to 7.4? It's common practice to series connect small numbers of 18650 cells without charge balancing circuitry; just be sure to use matched cells (from the same mfr lot if possible) and start them out at exactly the same voltage. A good match for a 7.4V 2600mAh pack of these batteries is this one, which will charge the pack in about 4 hours. So, I came here to ask a similar question. I'm maybe a little further along in research. There are parts that can charge 2-4 LiPo cells in series, with over volt protection and correct charge regime. For instance, MCP73213, 10 pin 3x3mm package. There are probably others, I'm not too far along with Googling and quizzing friends. Then cell balancing is (I gather) typically done with a separate part, such as a BQ29200, also a no-see-um package, also the result of only a few minutes googling. So another thing to guard against is undervoltage and excess current draw. I presume there are battery monitor/cell-balancers that have under-voltage outputs that could drive a FET switch or something to disconnect the load at low voltage. Anyway, it sounds like we have similar needs. I'd really like to use two of these in series to get 7.4V, and have some kind of bullet-proof charge controller circuit to use with them. I'd like to know what you find. Really awesome offering, particularly as I'm now looking for a power source for robotics platform I'm working on that uses a pair of 30v capable DC gear motors. My question is, does anybody have a link to some resources to build an appropriate charger? First thoughts are that 20 of these arranged as two parallel banks of 10 would be ideal for my project, however I'm clueless in what the charger for such a thing might look like. I have experience with an array of up to 10 cells in parallel in 0.01C type applications and they do not have balancing issues as far as I can tell simply because the voltage is drawn down simultaneously on all cells. They are essentially self leveling, where the stronger cells feed the weaker cells until becoming equivalent. I have never used series arrays but that seems like trying to balance a house of cards. A single cell charger is all that is needed to charge a parallel array. Depending on your application, a protection circuit on each cell would help stop the whole array from exploding if 1 battery fails short. Keep in mind that the initial current draw from a fully charged array will be sourced heavily from the strongest battery in array so high current draws on a freshly charged pack could be problematic, but the heavy load from the single cell should not last long as the cell voltages become equivalent. Maybe someone else can speak to heavy loads on parallel arrays. Gnarly. It would look gnarly. Look up cell balancing chips that can handle 10 cells, and the circuits that go with them. And that is just the balancing side, not the charging side of the battery controller. Most battery packs like that have a microcontroller overseeing the battery pack state-of-charge, with temperature monitors and the whole works. You might look at getting a replacement cell for a Nissan Leaf (there are after-market places where you can get them) I seem to recall that the SMBus protocol to talk to the Nissan battery is documented. I think the Nissan pack is 90V or so, though, if memory serves. I had previously purchased 18650 cells from eBay- the nameplate ratings said anything from 6AH to 4.2AH. The 6AH measured to be 800mAH and the 4.2 AH cells were 1.9AH. These off brand cells are never as good as their ratings. The SparkFun cells were spot on. Don't be fooled by sellers rewrapping cells. Very satisfied. Quality construction and battery, good discharge curve. Tabs are weakly soldered and come off easily. So like a lot of people I needed some 18650 cells for a project but I also dont want to solder straight onto a cell. Given that I lack a spot welder that seemed the only way to go.. but then I found these! They act as my starter pack now before I actually need to handle decent current. Which is why we have 4/5 stars. The discharge rate on these are fairly meh. My wife found within her stuff a forgotten cylindrical USB power bank, featuring a dead Lithium rechargeable cell. It surprised me finding almost no such cells with solder tabs on the market. But I needed one because I can't spot-weld. Luckily there was this one. I could build it into my device, charge it from the computer's USB jack and charge an iPhone 5. The phone got full, and the power bank not empty. The left-over charge couldn't replenish the phone a 2nd time, so I have to be happy with the successful single run.